On Friday night Thompson Boxing Promotions presented Locked ‘N Loaded, once again at the Doubletree Hotel in Ontario, CA. 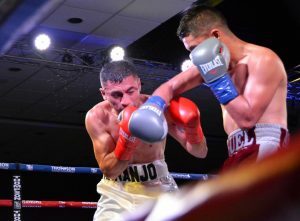 The main event of the evening saw welterweights Giovani “El Gallo de Oro” Santillan (24-0, 14 KOs) went up against Alejandro “Bad Boy” Barboza (11-2, 7 KOs), and Santillan was defending his WBO NABO welterweight belt. This title fight was to go a scheduled 10 rounds. The first round saw Santillan trying to strike early and establish dominance, and he did that. He roughed his opponent up a little bit. In the second he landed more leather on Barboza, who then came back with a fast and accurate combination of his own. Giovani was not bothered and continued with his game plan. That plan must have included an awesome body shot, because that is what put Barboza down and out at 2:33 of the second round. Santillan is still the WBO NABO welterweight champion. 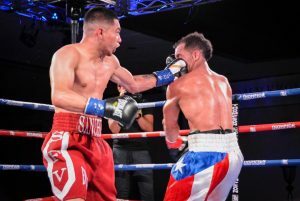 In the co-main event, Saul Sanchez (8-0, 4 KOs) faced off opposite Sam Rodriguez (5-3, 3 KOs) in a bantamweight bout that was scheduled for six rounds. The first round was a very strong one for Sanchez, as he almost knocked Rodriguez down. He stayed on the attack throughout the round. The second round saw a lot of action from each man. They were really going at it. Body shots were the order for the third, and both men delivered some good ones. The headhunting took over in the fourth, as these two were putting on quite a show. In the fifth it looked as if just maybe Saul would be able to put Sam away, but Rodriguez refused to be stopped and fought back. The sixth and final once again saw them exchanging leather. Rodriguez landed some very nice little combinations during these three minutes, only to get completely beaten up, then come back and once again refuse to go down. This was a very good contest, and we went to the scorecards. The judges saw the fight 59-55 twice and 60-54, all for Sanchez. He was the more skilled of the two to be sure, but Rodriguez gave a good account of himself. 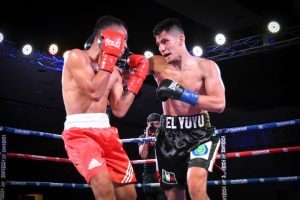 Next we saw Miguel Alcantara (5-0, 2 KOs) facing off against Jose Fabian Naranjo (3-8-2, 1 KO) in a fight scheduled to go four rounds in the super bantamweight division. We saw an exciting opening round, with both fighters landing some good shots and scoring points. Alcantara started it off, but Naranjo had a couple of big moments near the end of the round. These two fought head to head all of round two. It was as if it was the last round of a title fight. A lot of action going on and again, each man had their moments. They were both still throwing in the third, but their arms looked quite a bit heavier and slower, and for good reason. They had been pounding away non-stop at each other. In the fourth and final round they went right back to their respective punishments on each other. The fatigue was gone. We went to the scorecards. The three men scoring the bout saw it 40-37, 39-36 and 40-36, all for Alcantara. 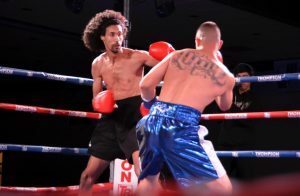 George Acosta (5-0) faced Bryan Tovar, (0-2) in a bout in the lightweight division. This fight was for a scheduled four rounds. Tovar went down early in the round, but there did not appear to be any damage done. That was not the case in the second however, when Acosta got Bryan on the ropes and just unloaded on him. The fight was stopped at 1:23 of that second round. 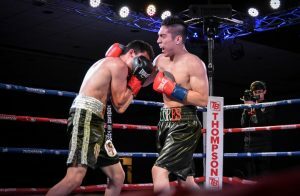 Jonah Flores (4-0) went up against Nery Garcia (1-4) in a fight scheduled for four rounds in the super bantamweight division. Flores left no doubt right from the get-go who was the faster fighter. He would land two quick left hand jabs and then throw back with his right just because he could. Garcia woke up in the second and landed some shots of his own, but Jonah still owned the show. Nery got a bit hotter in the third round, but so did Flores. Still, both were able to do some good body work as well as headhunt. There were some really good exchanges in the final three minutes, and we went to the scorecards. All three saw the fight the same, 40-36 for Flores. This was a great showing for the Henry Ramirez-trained Jonah. To open up the night we saw super welterweights Louie Lopez (2-0, 1 KO) and Jared Ejigu (0-3) square off in a bout that was to go a scheduled four rounds. We did not see a pretty first round, as Ejigu was quite a bit taller than Lopez and kept holding and pulling Louie down. He would also run a lot. Jared was a very awkward fighter. As ugly a fight as this was so far, both men actually landed some punches in the second. The best of those was a big left hand from Lopez that staggered his opponent. The third round was not a lot different. Ejigu continued to run and hold. It was obvious that Lopez was the more talented fighter. The fourth and final didn’t show us anything we had not already seen, and we went to the scorecards. All three of the judges saw the fight the same, 40-36, all for Lopez. This was certainly no surprise. Great job by Giovani to retain the title, as well as all of the winners tonight. Every fighter did good work, and this was another fun Thompson event.